I recently started a new Google doc to track Saturday Stats posts. I did not get all of them in there yet, but will be using this spreadsheet going forward. I thought it might be nice at the end of each year to look back and see what has been achieved. 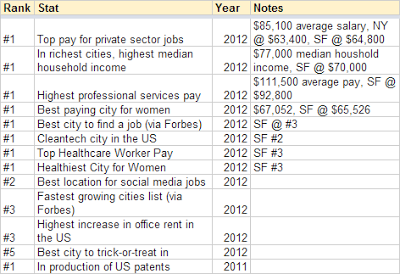 For 2012, I can tell you that reading all of the stats below back to back sounds pretty darn impressive. You can either click on the image below to enlarge or access the Google doc directly over here. San Jose was just listed as 2nd best city for men, according to Men's Fitness. Very cool, do you have a link?